It's official – as of August, Snapchat's dancing hot dog filter has been viewed 1.5 billion times, making it, in the words of Snap CEO Evan Spiegel, "the world's first augmented reality superstar". Is funky fast food the new metric of company health? No (we wish) – but it shows that AR really is resonating with people, even if Snap can't yet prove it on the balance sheets. Let's not forget that Snap wasn't always about AR, but as its Snapchat filters have gradually crept into the mainstream and grown more elaborate and impressive, make no mistake that it's firmly where the company is headed. At the same time, its Spectacles should be seen as a certified success, even if sales appear to have slowed. Snap Specs captured people's imaginations as a product that was fashionable and functional. Yes, yes, artificial scarcity gave it a nice boost, but there was a good product beneath the hype. Still, the wearable Snapchat camera felt like a proof of concept, with so much more potential. Of course, word quickly surfaced that this was just Phase One; Snap is rumoured to be working on a second pair of Spectacles that will put those augmented reality filters on our face. Snapchat is a massively popular platform, but could we see it pivot more to AR, specifically a wearable that uses its ever-improving augmented reality technology? We've rounded up the rumours and patents, together with some experts on the matter to tell us what they think is coming to the Snapchat AR Specs, and what they'd like to see. And yes, it will probably involve the dancing hotdog. The number of people within Snap who even know about the next Spectacles product is said to be tiny, but they can't stop us from looking at published patents. One particularly revealing patent filed by Snap shows off a pair of specs with AR tech on board. Choice quote: "The glasses… gather images using image sensors and use those images as a basis to generate and present augmented reality information to the user via display." The patent also makes reference to other wearables with mentions of visors, watches and even an augmented reality helmet. There were also some telling illustrations alongside, including the one above and others showing what an AR overlay might look like. Speaking to TechCrunch earlier this year, a source claimed the new Snap Spectacles will be "quite different" to the current version, which could mean anything quite frankly. Snap did a good job in making a first pair of glasses that were acceptably fashionable – a far cry from Google Glass, in other words. Several industry insiders we spoke to for this piece claimed to have heard about Snap's inside project, however none were able to tell us the specifics of what the new pair of glasses might look like. Make no mistake, Snap's glasses project is under heavy lock and key. "I believe if it doesn't happen it'll probably come down to being a cost or technology problem and not a willingness to do it," Anshel Sag, associate analyst at Moor Insights & Strategy, told us. "I genuinely believe that the Specs were a test run for AR glasses and a learning exercise about user experience and behaviour." And it's not just the patents; take a look at who Snap has been buying and the evidence starts to mount. Last year, Snapchat quietly acquired augmented reality startup Cimagine for what was reported to be around $30-40 million. The Israeli-based startup has built an augmented reality platform that enables consumers to instantly visualise products they want to buy in their intended location. While Snap has not made any indication as to how it would use the tech, it could be a great fit for a pair of Google Glass-style smartglasses. After all, before Snapchat Spectacles arrived on the scene, speculation of the company's move into hardware was fueled by a flurry of hiring new employees with a background in AR. Back in 2014, Snapchat purchased Vengeance Labs, a startup that was busy building smart eyewear that's able to record video of what a wearer sees. It also currently has an eyewear designer on its team in the shape of Lauryn Morris, who previously created designer frames for Michael Kors and mixed reality glasses startup Innovega. Morris was later joined by Mark Dixon, who previously worked on Microsoft's HoloLens headset, and Titan Pilpski, who joined Snapchat as an engineering director and used to work at Qualcomm, specifically on the company's Vurforia AR software. All of which points to big movements in AR, but how deep could Snap go on augmented reality in a wearable? 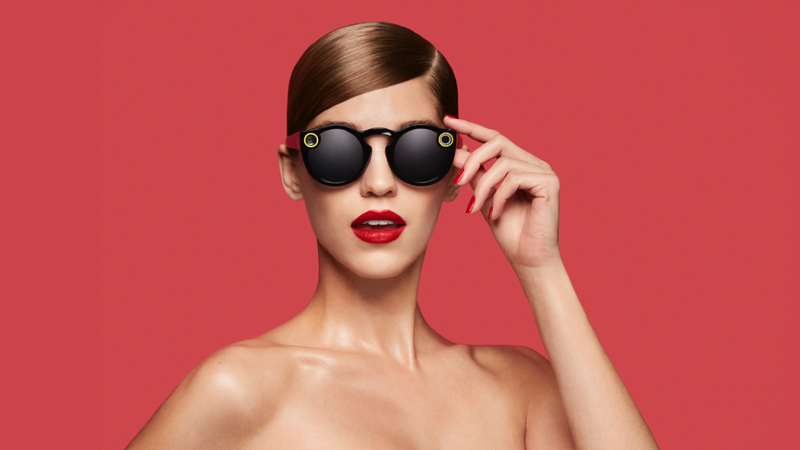 "Like it did with Spectacles, I imagine Snap would keep it simple and avoid Google's mistake of trying to do too many things with one device," said George Jijiashvili, wearables & VR analyst at CCS Insight. "More specifically, I think Snap would play to their strengths by focusing on two key aspects: capturing moments hands-free and augmenting those moments with interactive filters in real-time." This year has seen several companies partnering up in the name of wearable tech, and Snap could be set to do the same with its AR glasses. "One rumour I did hear was that they may license the Spectacles technology to other glasses manufacturers," Matt Miesnieks, managing partner at Super Ventures, told us. "Like Oakley, Ray-Bans, Gucci, whoever. It fits in with Snap's position in the market, and there's no way one brand – especially a small company like Snap – can reach into every segment of the market that we buy glasses for, whether it's sports or reading glasses or sunglasses, fashionable sunglasses. That could be a way they get their user experience out there quite widely adopted." This is an important point. Much of the success of Snap Spectacles can be put down to their fashion appeal. Sure, they look a little dorky with those cameras on the sides, but otherwise the specs do a good job of blending in as a normal pair of sunglasses. And granted, Snap didn't have the job of packing in a bunch of AR tech, but if it can keep the design as svelte in Snap Specs 2, it will have managed something that nobody else has. "Snap really sold them as a fashion product," said Miesnieks. "That was really smart – no one really clued onto that in the AR space before. Knowing that was kind of how they approached Spectacles 1, I'd expect them to continue down that path. If I had to guess I'd say Spectacles 2 would be similar to Spectacles 1 but less like a toy, more like something you'd wear more often and use more often." Ryan Pamplin, VP of augmented reality company Meta, says Snap is "leading the pack" in its AR strategy. He told us he gave a demo of Meta's AR tech to some of the Snapchat Specs team at the Siggraph conference. "I did not get the sense from their reactions that they have the display technology in development internally," said Pamplin. "I would not be surprised to see them partner with someone in the space for the display tech." Pamplin knows the constraints of building AR better than anyone else, and doesn't foresee Snap being able to roll out a pair of augmented reality specs at the right price point for at least a couple of years – and probably not until at least 2020. "I think the price sensitivity and the form factor will hold back the market realities from coming to fruition," he said. "I don't think they're going to be able to make something at a price point that's desirable to their user base, in the time frame of this year or next year." Virtual reality v augmented reality: Which is the future? Fancy spending time in a better version of the real world or new, artificial worlds? Snap's first camera-toting Spectacles, which launched in 2016, fairly recently started selling outside of the US for the first time. In May the company revealed that it sold an estimated 90,000 of the glasses from vending machines and since they were made available online. The latest quarter results suggest a decline in revenue from Specs, but could a pair of AR glasses perform much better? "I actually thought it was one of the best designed products of 2016 and I enjoyed using mine, but they proved a bit goofy to wear in public and easy to identify," added Moore Insights' Anshel Sag. "My personal experiences were mostly positive and I still use them from time to time. I think one thing I would've liked to see them do is bring more features to Spectacles, which they didn't really seem to do and I thought that they would do as the user base grew." Since its March IPO, Snap has had a tough time with Wall Street. While daily active users have risen, the company is making big losses, and rivals are largely to blame. Can Snap even sustain itself without a bigger hardware push? "I don't think so," said Sag, "unless they pull a rabbit out of their hat. They seem to be bleeding users heavily to Instagram due to Instagram Stories. I think that if they were to support AR early and in a compelling manner they would be able to not only retain users but bring back lost users and gain new ones." Spiegel made no reference to the rumoured AR specs in the latest investor call – something that may have given hope for the future. The project is likely too early on for the company to start getting people excited about, but with the AR space set to explode in the coming months it would be a good time for Snap to prove it's bullish. Apple's ARKit will roll out this September, and is predicted to give AR the shot in the arm it needs to go mainstream, while Magic Leap is poised to reveal its mixed reality hand before long. "They need Apple to succeed, they need Google to succeed," said Meta's Ryan Pamplin, who says Snap will need to keep its platform reaching as wide as possible – not building an insular ecosystem around its AR. "They're not going to burn their bridges with Apple and Google, who are inevitably going to have glasses in the future." Added Super Ventures' Matt Miesnieks: "I really think Snap is a bit of a dark horse in this big old augmented reality battle that's coming up, because they understand a younger market and they're starting to understand – better than anybody else – how to sell to that market, sell tech products. That ability and that strength is still currently underestimated by the Googles and the Magic Leaps of the world." What would you like to see in a pair of Snapchat AR Spectacles? Let us know your thoughts in the comments below.